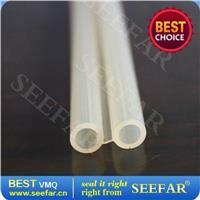 Silicone Rubber Tube Silicone and fluorosilicone rubber can be extruded in both solid and sponge on multiple extrusion lines. 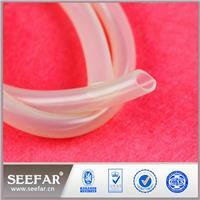 Silicone and fluorosilicone rubber can be extruded in both solid and sponge on multiple extrusion lines. 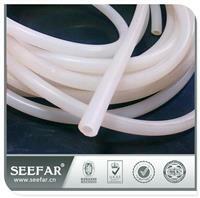 SEEFAR Manufacturing has the capabilities to provide standard products and profiles, including rubber seals, rubber tubing and silicone tubing, as well as custom extrusions…we can duplicate your product or sample. Our on-site engineering department will discuss economical ways to manufacture your unique designs. SEEFAR utilizes prototype design and builds tooling and molding in-house. By keeping the prototype process in-house, SEEFAR is able to control costs and provide faster deliveries. Rubber tubing sizes range from .040" to 3.00" O.D. with various wall thicknesses. I.D. from .015" to 2.00"
Cord sizes range from .031" to 2.00" O.D.